Belleek ornament is crafted of fine china in the shape of a shamrock; it is enhanced with hand-painted shamrocks. The Belleek shamrock ornament was introduced in 2015. This fine china Belleek ornament is in the shape of a shamrock that is enhanced with their famous hand painted green shamrocks. 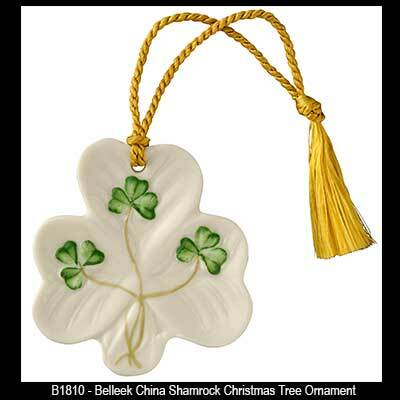 The Belleek China shamrock ornament measures 2 1/3" wide x 2 1/2" tall and it is ready to hang on your tree with the included gold tassel. Belleek ornament is made of fine china and features the message, I'd rather be in Ireland. Belleek ornament is crafted in fine china and features a verse from the Irish blessing, May the road rise to meet you. Belleek ornament features shamrocks and stars on fine Irish china.